Although 1-alkyl-2,3,6-trimethylbenzenes and a high relative amount of 1,2,3,4-tetramethylbenzene have been detected in marine oils and oil asphaltenes from Tabei uplift in the Tarim Basin, their biological sources are not determined. 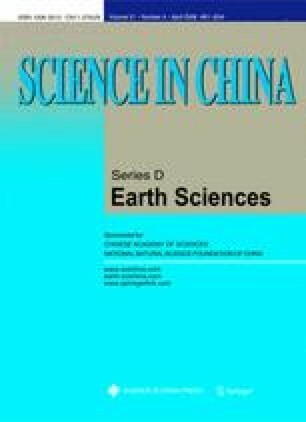 This paper deals with the molecular characteristics of typical marine oil asphaltenes from Tabei and Tazhong uplift in the Tarim Basin and the stable carbon isotopic signatures of individual compounds in the pyrolysates of these asphaltenes using flash pyrolysis-gas chromatograph-mass spectrometer (PY-GC-MS) and gas chromatograph-stable isotope ratio mass spectrometer (GC-C-IRMS), respectively. Relatively abundant 1,2,3,4-tetramethylbenzene is detected in the pyrolysates of these marine oil asphaltenes from the Tarim Basin. δ 13C values of 1,2,3,4-tetramethylbenzene in the pyrolysates of oil asphaltenes vary from −19.6%. to −24.0%., while those of n-alkanes in the pyrolysates show a range from −33.2%. to −35.1%.. The 1,2,3,4-tetramethylbenzene in the pyrolysates of oil asphaltenes proves to be significantly enriched in 13C relative to n-alkanes in the pyrolysates and oil asphaltenes by 10.8%.–15.2%. and 8.4%.–13.4%., respectively. This result indicates a contribution from photosynthetic green sulfur bacteria Chlorobiaceae to relatively abundant 1,2,3,4-tetramethylbenzene in marine oil asphaltenes from the Tarim Basin. Hence, it can be speculated that the source of most marine oil asphaltenes from the Tarim Basin was formed in a strongly reducing water body enriched in H2S under euxinic conditions.